situated in the Great Smoky Mountains. Presented by the non-profit Cherokee Historical Association, the Oconaluftee Indian Village is a glimpse of the past. Here you will see the model of a Cherokee village from over 225 years ago! Cherokee guides in native costume will explain their history, the culture and life-style of their ancestors, and answer your questions. All this while pausing to watch Cherokee demonstrate their arts and crafts. This 18th century replica of a Cherokee community contains a replica of a 7-sided Council House and typical homes as they were 250 years ago. 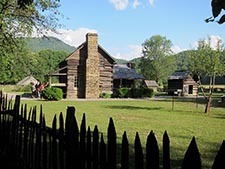 The Oconaluftee Indian Village is open daily 9 a.m.-5 p.m. May 9-Oct. 18. Admission costs $15 for adults and $6 for children ages 6-12. Children ages 5 and younger are admitted free and group discounts are available. The Village is on Drama Road, near the Mountainside Theatre, off U.S. 441 in Cherokee. The Mountain Farm Museum, situated on the banks of the Oconaluftee River just inside Great Smoky Mountains National Park, is a collection of southern Appalachian farm buildings assembled from different locations throughout the Park. Mingus Mill, an 1886 turbine mill, ground corn into meal and wheat into flour for over fifty years for the mountain community near Mingus Creek. In place of a wooden water wheel, a small steel turbine provided power to turn the mill's stones and machinery. The National Park Service rehabilitated the mill in 1968, and Mingus Mill operates during the summer as an historical exhibit. 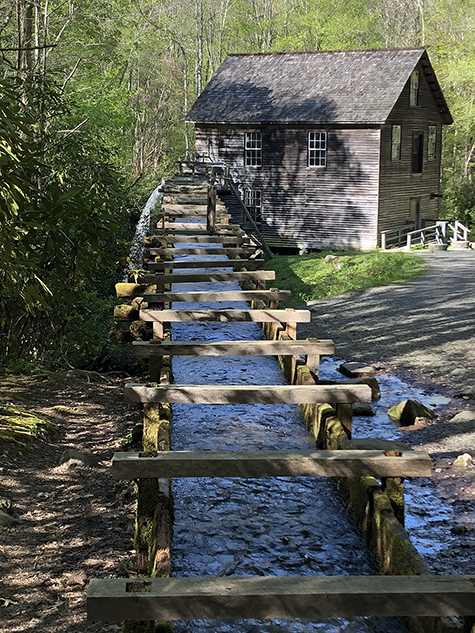 In 1937, Mingus Mill was one of the first buildings restored as an historic structure in the newly created Great Smoky Mountains National Park. Deep within the Smoky Mountains is a valley unlike you've ever seen. Far from big cities and beyond the expectations of its visitors, Maggie Valley is a place where nature offers its best and fun vacations begin. The Smoky Mountains are the oldest on earth and provide wonderful experiences at every turn. Dominated by mile high peaks, lush valleys, rushing rivers, and more species of birds, plants, animals, and tree than anywhere else in the world, these mountains are nothing less than exhilirating. Quaint shops, respected artisans, parks, fishing lakes, historical sites, great entertainment are all part of Maggie Valley. Qualla Boundary/Cherokee Trout Fishing Season -- All rivers and ponds are open every day from the last Saturday in March through the end of the following February. This is a great resource for students. 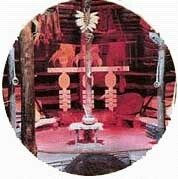 This site has information on Cherokee culture, government, and lots more. 1984 Cherokee "Original Keetoowah Society"
1984 55 min. Documentary Video "Spirit of the Fire" - revealing the "Original Keetoowah Society" spiritual core of the Cherokee Nation. The Smithsonian institution was turned down by the Nighthawk Keetoowah elders in favor a Tulsa news man, Sam Jones because he had "blue veins" and came in a good way. KJRH TV Tulsa's Sam Jones was privileged to produce this documentary - filming the sacred Stomp Dance, Pipe Ceremony and display of Keetoowah Wampum Belts for the very first time. Georgia Tribe of Eastern Cherokee - A state recognized Tribe of fully documented Cherokee descendants. Copyright © 1996-2015 by Image Builders. All rights Reserved.